Performance Muscle Car aluminum shocks don't have to break the bank to provide the ride quality and performance you need. Arguably the most versatile suspensions available, the g-Bar system offers a huge array of configuration options, including link bars, anti-roll bars, VariShock coil-over or air-spring shocks, shock valving, and FAB9 rearend housings. With the introduction of their hi-tech gStreet coil-over front suspension system, Chris Alston’s Chassisworks has once again combined the very finest attributes of form and function. Extremely lightweight (144 lb. 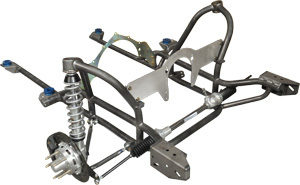 ), factory welded 1-5/8” 4130 tubing, direct bolt-on drag race strut suspension system for ‘67-’69 Camaros and ’68-72 Novas. The system can be configured for different levels of performance including street friendly urethane-bushed g-Bar arms, more handling oriented pivot-ball g-Link arms, or the rod end equipped 4130 ProPower arms. Designed to accommodate tall-deck engines, large diameter headers and custom plumbing, CW Chevy II clips are fabricated from 1 5/8”x .083” 4130 round tubing and attach directly to the factory lower frame and firewall mounts. Bolt-on an excellent seat-of-the-pants handling improvement without a ton of effort. Check out the new gStreet™ shock and anti-roll bar package for 1958-64 Impalas and related models. Chassisworks now offers a coil-spring configuration of their popular gStreet suspension system for '67-69 Camaros (GM F-Body) and '64-72 Chevelles (GM A-Body); perfect for street performance applications not requiring the added adjustability of a full coil-over suspension. Chris Alston’s Chassisworks now offers a top-quality, bolt-on rear coil-over suspension conversion for 1964-1972 GM A-bodies. Chassisworks new g-Bar/g-Link system is a very sophisticated canted-4-bar rear suspension conversion that offers the superior handling and ride characteristics of new muscle and high-performance vehicles. Converting the stock front suspension of your 1962-67 Chevy II Nova or Canadian-GM Acadian to coil-over shocks is now a simple bolt-on procedure.